Mikko Hirvonen takes win in Finland! 02.08.2009: Mikko Hirvonen's resurgent form in the 2009 World Rally Championship continued today when the Ford Focus RS driver scored a dominant maiden victory on his home round of the series, Neste Oil Rally Finland. Mikko Hirvonen's resurgent form in the 2009 World Rally Championship continued today when the Ford Focus RS driver scored a dominant maiden victory on his home round of the series, Neste Oil Rally Finland. The result was Hirvonen's third consecutive victory this season, the tenth of his career, and moved him further ahead at the top of the FIA drivers' championship standings, three points clear of defending champion Sebastien Loeb, who finished second today. 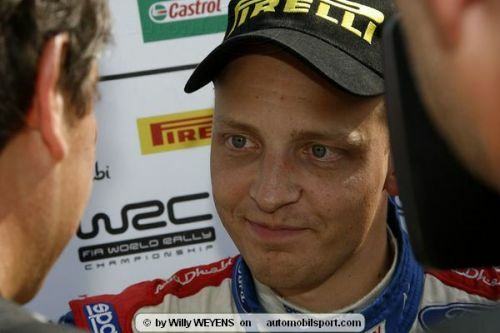 Victory on Rally Finland, the fastest round of the World Rally Championship, is seen by most drivers as the ultimate prize in the championship calendar - but it was especially sweet for Hirvonen, 29, who lives in host city Jyvaskyla and was tackling the event for the eighth time. On last year's event he finished second, trailing his Citroen rival Loeb by nine seconds. However this year Hirvonen led from the second stage in his BP Ford Abu Dhabi team car, beating his rival fair and square by 25.1 seconds. Mikko's team-mate Jari-Matti Latvala claimed third place, with Loeb's team-mate Dani Sordo fourth. Finland's Matti Rantanen rounded off the top five places after a sensational drive this weekend and a nail biting last day scrap with Sebastien Ogier.